Choose a pot large enough to hold all the lobsters comfortably; do not crowd them. A 4 to 5- gallon pot can handle 6 to 8 pounds of lobster. Fill with water, allowing 3 quarts of water per 1-1/2 to 2 pounds of lobster. Add sea salt (to taste) to water. Bring the water to a rolling boil. Add the live lobsters one at a time, and start timing immediately. Do not cover. Stir the lobsters halfway through cooking. Let the lobsters rest for 5 minutes or so after cooking to allow the meat to absorb some of the moisture in the shell. For timing, use the weight of individual lobsters, not total weight of all lobsters being cooked. Choose a pot large enough to hold all the lobsters comfortably; do not crowd them. A 4 to 5- gallon pot can handle 6 to 8 pounds of lobster. Put 2- inches of seawater or salted water in the bottom of a large kettle. Set a steaming rack inside the pot and bring to a rolling boil over high heat. Add the live lobsters one at a time, cover the pot, and start timing. Halfway through, lift the lid carefully (the steam is very hot) and shift the lobsters around so they cook evenly. In a small saucepan, slowly melt butter over low heat being careful not to let the butter brown. Add lemon juice, parsley and seafood seasoning. Stir to blend thoroughly. Serve warm for dipping. Boiling and steaming are the methods of choice when you want to serve diners a whole lobster. Boiling is a little quicker and easier to time precisely, and the meat comes out of the shell more readily than when steamed. For recipes that call for fully cooked and picked lobster meat, boiling is the best approach. In contrast, steaming is more gentle, yielding slightly more tender meat. Steaming preserves a little more flavor and it's more forgiving on the timing front. It's harder to overcook a steamed lobster. When you need partially cooked lobster meat for a dish, parboiling is the way to go. Parboiling, or blanching cooks the lobster just enough so that the meat can be removed from the shell. Then you can chill the meat down and reuse it later in a dish that calls for further cooking. Cooked lobsters will turn bright red, but that's not the best indicator of doneness, especially for large lobsters. 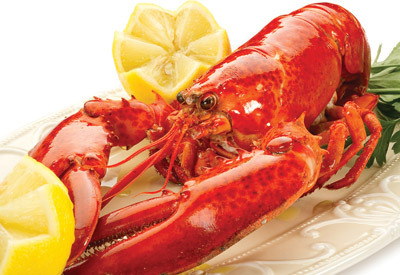 Lobsters may still be underdone when the shell turns red. Cook the lobsters for the recommended time, then crack one open where the carapece meets the tail. If it's done, the meat will have changed from translucent to white. *Lemon Parsley Butter - recipe may need to be doubled depending on the number of lobsters served.